When Kennedy was born with unilateral clubfoot in Liberia, his parents were consumed with worry and fear for their son’s future. Kennedy’s mother Benetta did not know what to do; she and her husband were facing ridicule in their community because of Kennedy’s clubfoot. They decided they would take the child to live with his grandmother in her village in order to avoid further ridicule. 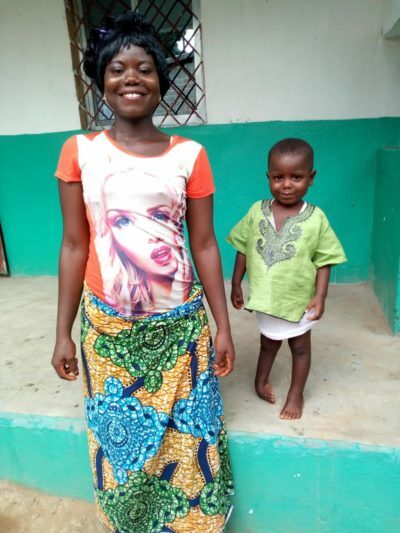 Fortunately, just as they were about to leave, a friend in their community told Benetta about Faith Clinical Orthopedic Rehabilitation Center (FACORC), MiracleFeet’s partner in Liberia. FACORC had broadcast a radio announcement that they would treat clubfoot for free in clinics throughout Liberia. There was a clinic at Phebe Hospital, said the friend, which was not far from where Benetta lived. Benetta thought this could be the solution for Kennedy, so she immediately went and told her husband, who agreed that they should go to Phebe right away. Kennedy received his first cast upon arriving at the clinic; three weeks into casting, Benetta could already tell that the treatment was transforming Kennedy’s foot. Like many parents, Kennedy’s mother and father hope he will grow up to be a doctor and help other children. Right now, however, they are focused on celebrating a different milestone: Kennedy’s traditional welcome ceremony. Although he is now four years old, because of the shame and ridicule the family experienced, they never performed the customary ritual after his birth. They plan to invite the FACORC team to the welcome ceremony and are eager to be advocates in their community to help other children born with clubfoot.